· to create an object of greater value from (a discarded object of lesser value). 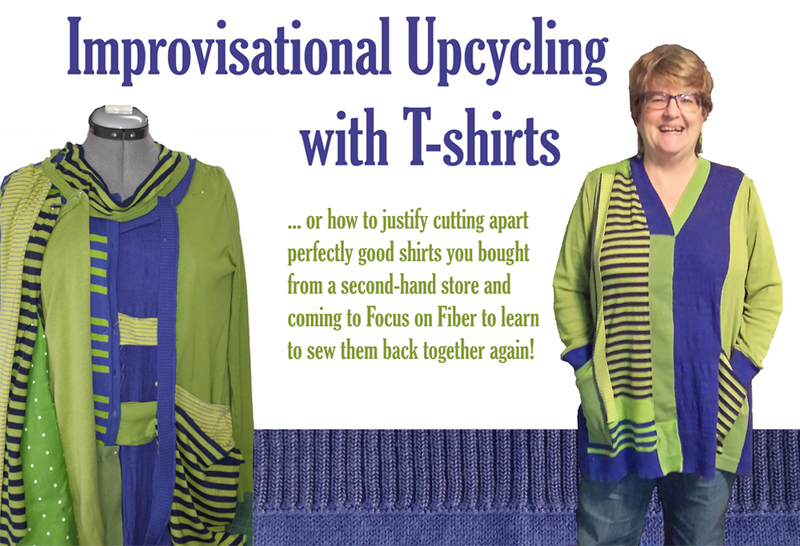 Do you want to learn how to create easy-fitting, truly wearable art by upcycling inexpensive thrift-store knit t-shirts into something unique and comfortable? Are you apprehensive about sewing with knits? Join this 2-day class and create your own top or dress. Deb Cashatt has lots of tips and tricks for creating comfortable, well-fitting tops with pizazz. Start with personalized pockets and work out from there. Learn which of your machine stitches are best for sewing knits and experiment with a serger for speedier results. Stay for the retreat and Deb, along with special guest star Kris Sazaki will be there to assist you on your improvisational upcycling journey. Deb has been playing with fabric for as long as she can remember. She started out by making “pockets” when she was a child. In jr. high, she was making her own clothing, and in high school she was making garments for the sewing teachers. In college she took textile courses to relieve the tedium of her classes in business administration. After earning an MBA, Deb returned to her love of sewing, creating wedding dresses for her friends. She went on to receive an adult education credential for teaching clothing construction, and returned to her alma mater to aid and substitute for her high school sewing teacher. For the past 15 years Deb has been one half of the PIxeladies. She and old (umm, long-time) friend Kris Sazaki, the duo teach Photoshop online, design art quilts, and digitally print on fabric. Deb lives in Cameron Park, CA with her husband Dave. Deb loves to teach and really, really likes to travel. She is fortunate to have friends who move to exotic places just so she can visit them. She thinks the world would be a better place if people wore boas and drove cars with fins. If you are commuting, you may arrive 8 AM on the 7th, take your supplies to Dance Studio and join us for breakfast. Class starts at 9 AM. You may eat all meals with us for the two days of class. At the end of class on the 8th, if you are not coming back for retreat/extended time with Deb, you should clear out your supplies after supper. If you are staying on campus, you may arrive after 2 PM on the 6th and set up your room. As there is a class in the Dance Studio, you will have to wait till after supper before you take in your supplies for class. If you are coming in on the 7th, take your supplies to Dance Studio and join us for breakfast. Staying on campus counts nights instead of days, so you have the option of coming in the afternoon before class or coming in the first day of class. You may leave after the class on the 8th after dinner or you may stay that night and leave the next morning after breakfast. Additional information: Deb and Kris are staying for the whole retreat! So, if you are working on a clothing project, you will be able to access your mentor for additional help at no extra charge – you just have to be enrolled for the retreat on those extra days.